A European Ariane 5 rocket, burning a cryogenic mixture of liquid hydrogen and liquid oxygen, thundered into the sky over French Guiana at dusk Tuesday with two communications relay satellites to serve the Arab world and India. 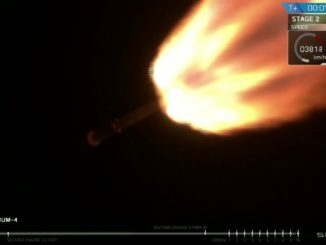 Like clockwork, the rocket lit its liquid-fueled Vulcain 2 main engine at exactly 2134 GMT (4:34 p.m. EST), ran the engine through a super-fast computer health check, then commanded its two strap-on solid motors to fire seven seconds later. The collective power of the main engine and twin boosters pushed the Ariane 5 off its launch pad at Europe’s space center in Kourou, French Guiana, a space city on the northern coastline of South America. Streaking through clouds on 2.9 million pounds of thrust, the Ariane 5 quickly shot past the speed of sound before dropping its two solid rocket boosters into the Atlantic Ocean offshore French Guiana. A minute later, the rocket jettisoned its nose cone after ascending out of the dense lower layers of the atmosphere. 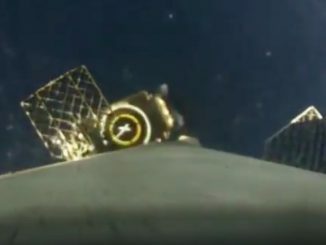 The Vulcain 2 main engine switched off on schedule after a nine-minute burn, then the Ariane 5’s HM7B upper stage engine ignited for a 16-minute firing to drive the mission’s two satellite passengers — Arabsat 6B and GSAT 15 — into geostationary transfer orbit. A few minutes later, the launcher deployed the Arabsat 6B communications satellite, then ejected a hollow adapter to expose the smaller GSAT 15 telecom spacecraft for separation. A launch engineer announced the critical deployment milestones, and managers and dignitaries gathered at the Guiana Space Center’s Jupiter control center broke into applause. 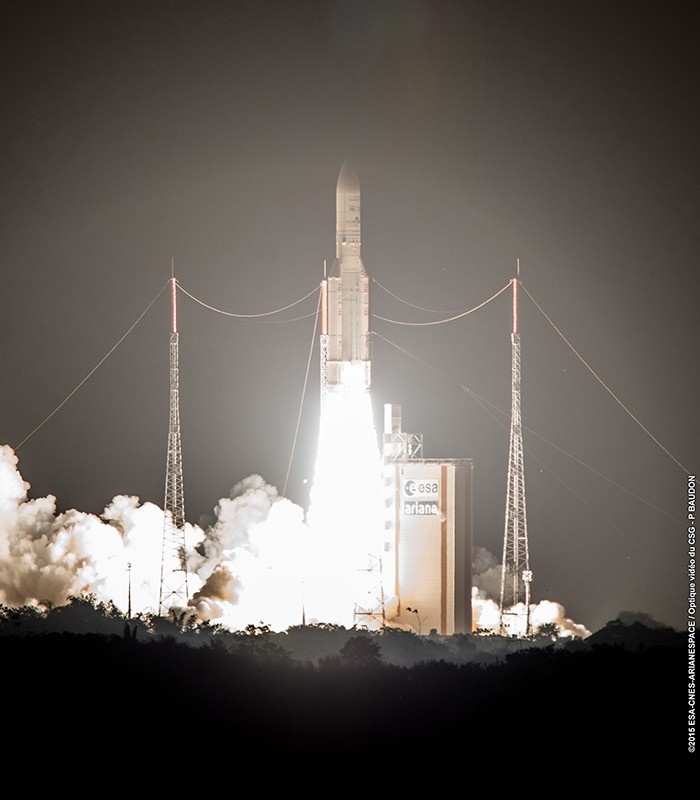 Arianespace’s chairman and CEO Stephane Israel confirmed the cause for celebration. The mission’s target: an orbit with a high point of 22,236 miles (35,786 kilometers), a low point of 153 miles (247 kilometers), and an inclination of 4 degrees. Independent orbit tracking data from the U.S. military indicated the flight achieved its target. Arabsat and Indian space officials said ground controllers have acquired signals from both newly-launched satellites, which were performing as programmed shortly after flying free from the Ariane 5. The flight notched the Ariane 5 rocket’s 69th consecutive successful mission since 2003. The Arabsat 6B telecom satellite, to soon be renamed Badr 7, and India’s GSAT 15 spacecraft will propel themselves into circular geostationary orbits approximately 22,300 miles over the equator. “We just signed the birth certificate for Badr 7,” said Mueid Al-Zahrani, chief technology officer for Riyadh, Saudi Arabia-based Arabsat, a pan-Arab intergovernmental consortium founded in 1976 by the Arab League. 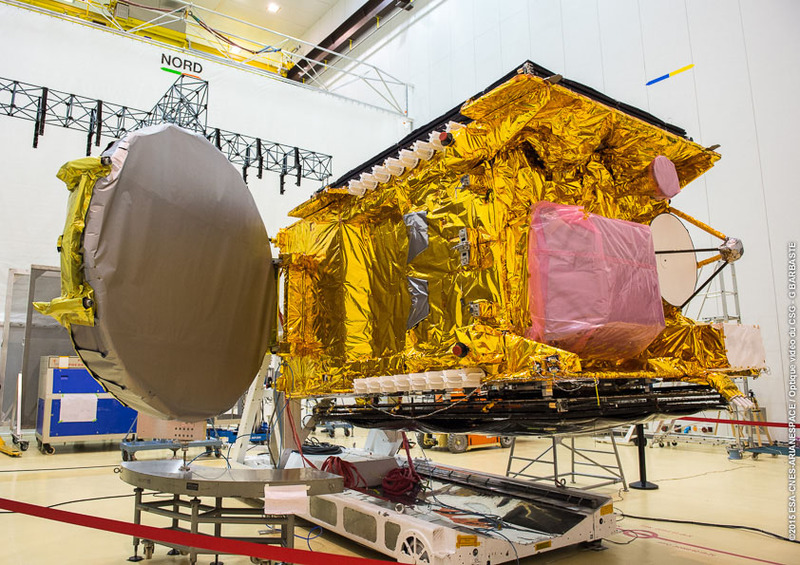 With a launch mass just shy of 5.8 metric tons, or 12,784 pounds, the Arabsat 6B satellite was manufactured by Airbus Defense and Space, with its Ku-band and Ka-band communications payload provided by Thales Alenia Space. 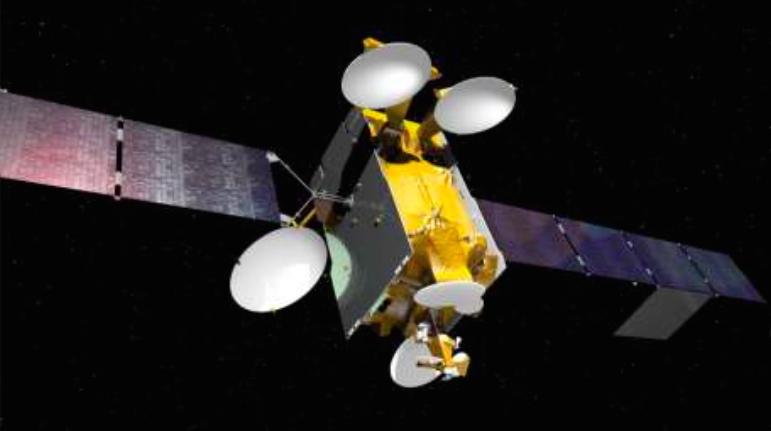 From its final orbital perch at 26 degrees east longitude, Arabsat 6B will beam hundreds of television channels and broadband services across Africa, the Middle East and Central Asia for a 15-year mission. 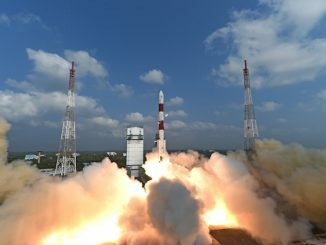 The 6,975-pound (3,164-kilogram) GSAT 15 satellite, owned and operated by the Indian Space Research Organization, is heading for a post at 93.5 degree east longitude, where it will replace India’s Insat 3A telecom spacecraft launched in 2003. GSAT 15 hosts 24 Ku-band transponders and an L-band GAGAN navigation payload to supplement GPS signals over India. Its 12-year mission — with a cost of $128 million, according to Indian media reports — will focus on secure and emergency communications, navigation, and video broadcasts. Tuesday’s launch was the Ariane 5’s sixth and final flight of the year, but Arianespace has two more missions on its books before the end of the year. A light-class solid-fueled Vega booster will blast off from French Guiana on Dec. 2 with the European Space Agency’s LISA Pathfinder probe, an experimental spacecraft heading for the L1 Lagrange point nearly a million miles, or 1.5 million kilometers, from Earth. LISA Pathfinder has been fueled for its mission to test out technologies for a future gravitational wave observatory to open a new window on the universe. Technicians plan to transfer the probe to its launch pad next week. Europe’s next two Galileo navigation satellites are also at the Guiana Space Center for final launch preparations ahead of a Dec. 17 liftoff aboard a Russian-built Soyuz rocket. The last two flights of the year would give Arianespace 12 missions in 2015, a mark the launch services company has not achieved since 2002. For the Ariane 5, Tuesday’s mission was the 24th straight time dating back to 2011 the rocket has launched on the first attempt once fueled in the final hours of the countdown. “Launch after launch, we are demonstrating our capability to increase our operational pace while remaining the most reliable solution for all our customers,” Israel said. The next Ariane 5 launch is scheduled for Jan. 27 with the Intelsat 29e communications satellite on the rocket’s first single-payload dedicated commercial flight since 2009.